Manuel Pégourié-Gonnard asked whether I’d looked at the number of posts to the texhax mailing list when I posted last night about traffic to comp.text.tex. I had considered it, but I ran out of time, then, to scrape the data from the online archives. See above for the newly-gleaned information. Interesting enough (and perhaps gratifying) to see that texhax traffic has remained constant over the last eight years; the mailing list itself dates back to 1986 but only recent years were available for my primitive data-analysis skills. 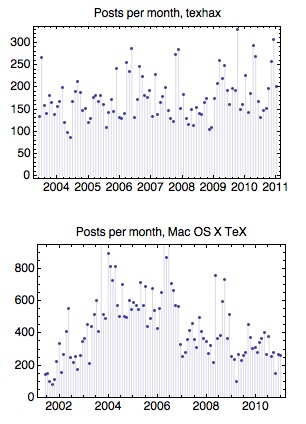 Since 2007 the data for the Mac OS X TeX mailing list is pretty much constant, tracking slightly above texhax in terms of number of posts per month. I also mentioned yesterday that I think a fair chunk of the traffic to comp.text.tex may have moved to tex.stackexchange.com. The ‘tex.se’ Q&A site officially launched three months ago after a three month beta period. At that time, the site had on average 12.7 questions per day with 2.4 answers being given per question (numbers from area51). Three months later, being now, the site receives 24 questions per day, and the answer ratio is slightly lower at 2.1 answers per question. In total, the site currently contains some 3400 questions and 7200 answers: the equivalent of around 1700 ‘posts’ per month (I don’t have exactly numbers to the day for how long it’s been operating). And this rate seems to be increasing, although two data-points is hardly a trend. Compared to the traffic for comp.text.tex and the mailing lists I’ve shown above, I don’t think you can argue that tex.se is now playing a very important role for TeX support.